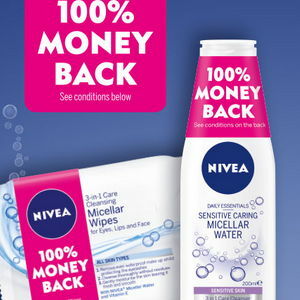 NIVEA Micellar Wipes 25 wipes. To claim 100% of your money back, you will need a picture or scan of your receipt before you start the claim process. The scan needs to clearly show your receipt details including the date of purchase, the retailer and the product purchased. Please ensure your scan is less than 1MB in size and in one of the following formats – JPEG, PNG or PDF. Please keep a copy of your receipt. I’m a nivea♡ fan.i want to win this time.. I love Nivea, good luck to all!